Over the last days a never seen influx of Alpine Accentors has been witnessed almost everywhere in Germany, which were sometimes accompanied by the even rarer White-winged Snowfinches. The first of these alpine passerines have already reached the coast, but at the moment chances are best at the highest low mountain ranges (Schwarzwald, Fichtelgebirge, Rhön, etc.). Unfortunately, I'm very busy at the moment and won´t have a chance to visit some of the potential resting sites. 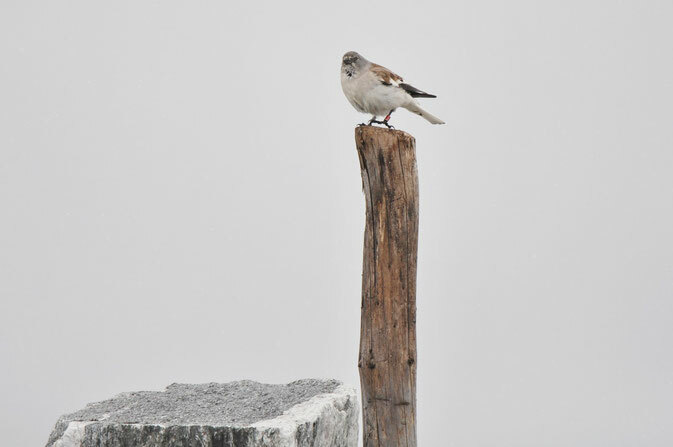 In Franconia there has so far been only one sighting of two Alpine Accentors which were seen on the plateau of the Schneeberg in the Fichtelgebirge. However, there are more potentially sites in the Fichtelgebirge like the "Platte" or the "Ochsenkopf", which should also be checked. Furthermore, the Rhön also offers good resting habitats, especially on the higher altitudes. By now two different groups of Alpine Accentors and at least two White-winged Snowfinches were reported from the hessian part of the Rhön (see here and here), in the bavarian/franconian part no one even searched! The next couple of days should be very interesting!